Turning 18 is a special milestone that is less about earning the right to drink and more about celebrating youth in all its awesomeness. Some 18 year olds are studying, some have secured their first job and others are travelling the world. All are on a journey of self discovery. 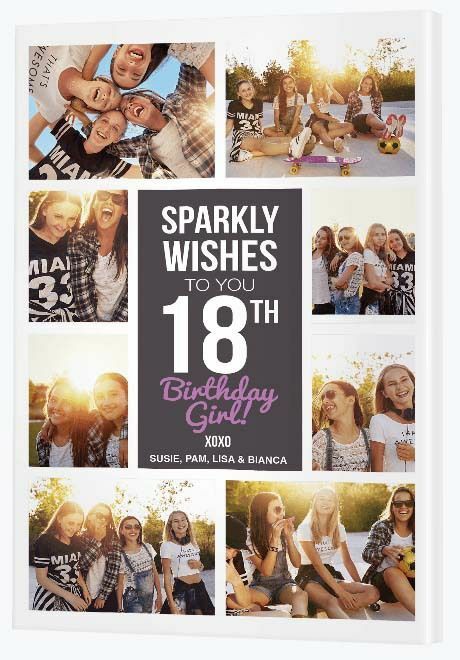 This selection of 18th birthday present ideas celebrates life, love and laughter. Live it. Love it. Laugh. This is an awesome gift for a young man from his friends, a photo collection of all the different activities they enjoy together. Impress your mate with this very cool canvas wall display. All you have to do is gather together the best photos from Facebook and Instagram (or your waterproof camera!). 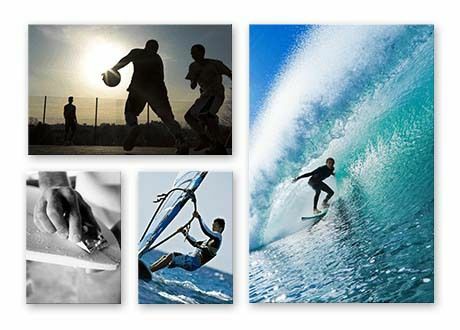 Select photos of that one favourite sport you all do together or shots of a variety of activities - surfing, cycling, rockclimbing, basketball. This is a personalised gift, but rather than gushy sentiment it's full of excitement so a great gift from the boys. Hey girl! She will absolutely adore this personalised print, something just for her from all of her amazing girlfriends. Get the girls together to create a gift she will hold onto forever. 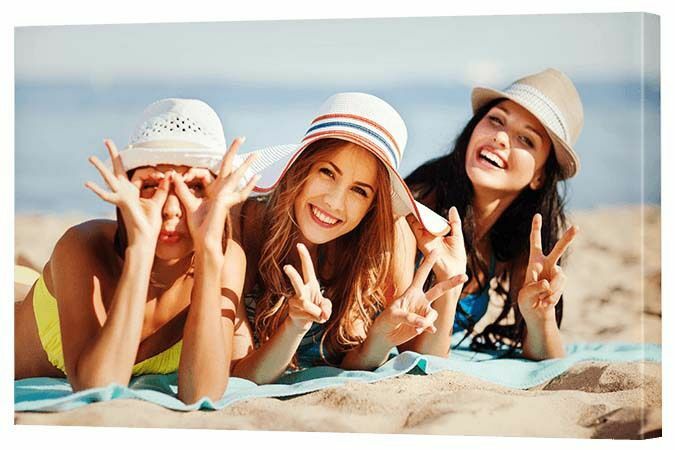 The idea is to choose photos of the birthday girl having a great time with all her friends and include them on this 'traditional' canvas collage. Why not get each person to choose 1-2 photos each? Leave the centre panel for a special, personalised image. Choose the most creative friend to design something up, either in Photoshop or Canva. Canva's great as you don't have to be a graphic designer to use it. Write something from the heart then sign off from all the girls! In Canva, simply choose an upright shaped design then use a blank template to add a background. Write the message in a funky font style and colour. You'll need a high resolution image, so be sure to select 'PDF: To Print' when you're ready to download it. Save it somewhere safe then add it, along with your other photos, to the Canvas Factory CanvasApp's traditional collage template. Voila! You've just turned our traditional collage template into the most awesome gift ever. Keen to claim the title of coolest parent ever? Then here's something funky to gift your daughter - urban art. Many of our customers think we only print canvas photos that you upload yourself - family portraits, travel photos, pet prints. However, we also have a library of over 25 million images you can browse through, many of them gorgeous art that will enhance your home's interior. 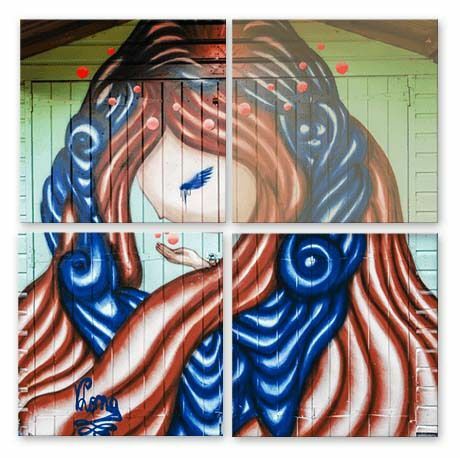 Our Urban Art collection is a compilation of edgy, streetwise art images, much loved by the young and the young at heart. This feminine, but funky example will put a smile on the dial of any teenager who's ready to say goodbye to their boy band posters. And that's what 18 is all about, isn't it? If your son's full of adventure then this photo gift on metal will celebrate that courageous streak. Create amazing metal art using intrepid sports he either can't get enough of or aspires to conquer. Sure, it's scary for you, the parent, but hey - at least it doesn't involve drugs and alcohol right? This metal wall display provides the opportunity for 3 photos, but if you're after a larger display be sure to check out our full selection. If you're looking for great rather than just good 18th birthday presents, you've come to the right place. 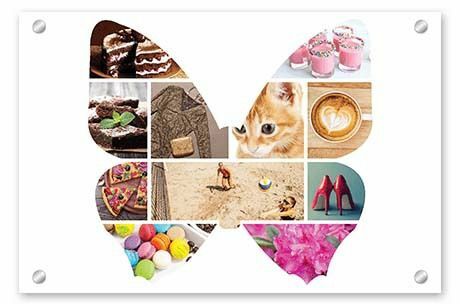 This pretty glass butterfly collage, from our silhouette collection, is way better than something off the shelf. It's a gift she'll treasure forever. If your best friend is turning 18, show you truly know her and care by putting together a photo collage featuring all her favourite things. This personalised collage can include any photo at all - a favourite food, a favourite activity, a favourite sport. Visit her Facebook and Instagram pages (or your own!) and find photos that truly capture your friend's personality. If you have a mate that loves cars, this metal print - of his own car - will be an absolute hit. If car photos adorn his Facebook and Instagram profile then this gift is so easy to create. Simply download a photo from Facebook and upload it to our CanvasApp, selecting 'aluminium' as your material. For an arty effect, remove the colour from the photo. You can do this using our Effects tool. 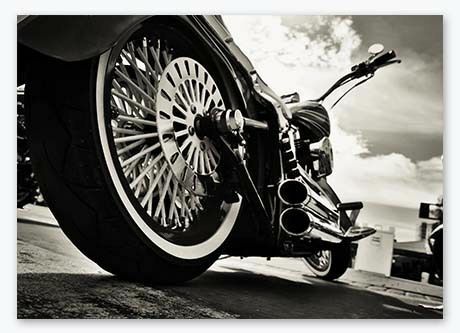 Black and white prints look amazing on brushed aluminium and this personalised print will be no different. This is one for the artists and the lovers out there. 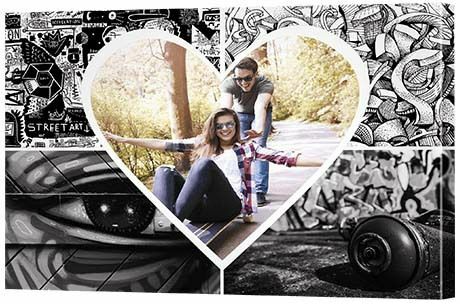 Transform a modish heart collage into a work of inspired art. When it comes to love, the most thoughtful 18th birthday presents are cherished long after the gift-giving moment has passed. This is one of those gifts. Adorn the outside frames of your collage with your own original artwork then display a photo of you and your girlfriend or boyfriend in the centre frame. Another one for the young lovers out there, 18th birthday presents for guys or girls who love to get out there and enjoy life. This 'Live Laugh Love' themed glass collage is full of positive messages, a wonderful way to inspire a happy future. Gather together photos of you both together, out and about having a wonderful time. Try to avoid too many selfies (although one or two are fine!). Depending on your budget, you can print this collage on canvas, glass or metal. Do you and your best friend want to travel? Perhaps this gift will inspire your friend to save her pennies! The idea is simple. Want to travel to Berlin, Croatia, Rome, Vienna and London? Well put those photos on a canvas collage to create the excitement that's needed to spur her into action! There are some beautiful free high resolution photos available on Flickr and Unsplash. On Flicker you can pretty much search for any city in the world and something awesome will come up. Just be sure to check usage rights and download a high resolution image. On Unsplash you'll find a beautiful selection of free, high resolution photos. They are very arty and, oftentimes, not well labelled, but if you know what you're looking for it's a great way to secure high quality photos. 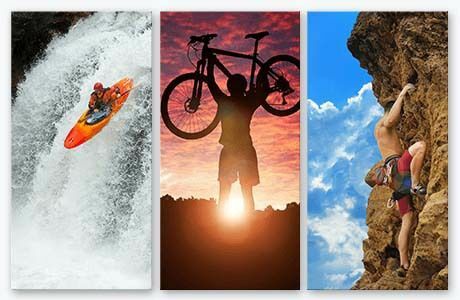 If you find yourself completely stuck, be sure to browse through our own selection of canvas art photos. Unfortunately our tool only lets you choose one photo per print, but they are actually all free, so if you contact us with your selection, we'll put together your collage for you at no extra cost! 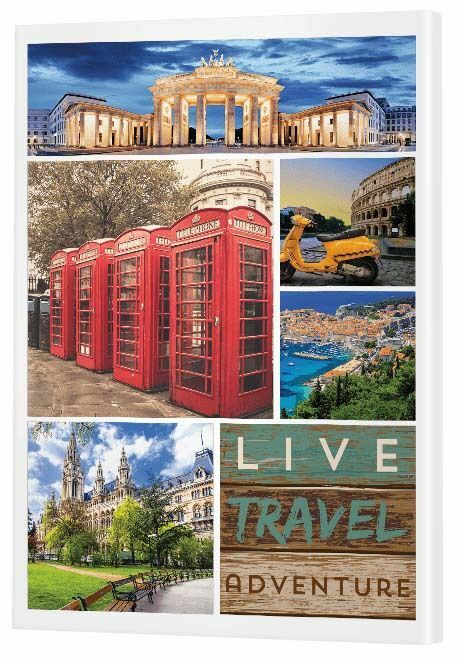 Download a selection then upload them into our CanvasApp to create a 'Live Travel Adventure' themed collage, one of our most popular canvases. With this hanging as inspiration on her wall, your 18th year together is going to be one to remember in no time. No 18th birthday party is complete without a photo board display, but why settle for something DIY when you can create a gorgeous keepsake like this? You know how it goes. You gather together all the funny, touching and momentous photos from birth to age 18, glue them to a piece of cardboard then stick the card on a wall using blu-Tack or mounting putty. Say goodbye to old school DIY and hello to the 21st Century gift that keeps on giving, long after the party has ended. 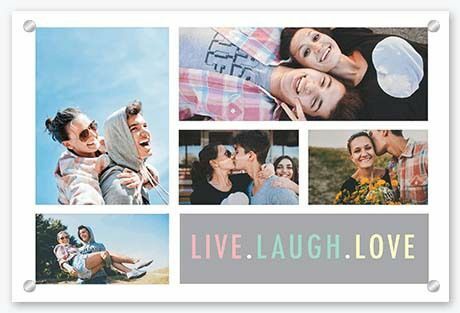 Gather up the best of the best photos of the 18 year old, scan them in at a high resolution and upload them to our CanvasApp to create a stunning canvas wall display. This example has a massive 9 frames to fill, giving you the opportunity to honour the best days of their life. They will never want to dismantle it and, good news is, they don't have to. It can become a part of their heart and home for years to come. It doesn't matter how happy or grumpy your sibling usually is, turning 18 is all about new beginnings so gift them something that will inspire greater heights. 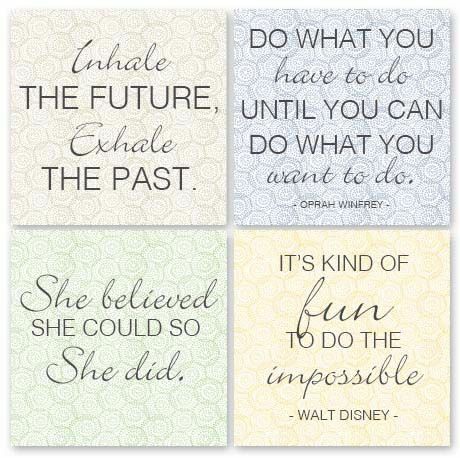 Give your 18 year old brother or sister a fresh start with a wall display of inspiring quotes. It doesn't matter if the quotes are from famous people or simply stolen from a Pinterest board, it's all about creating a personalised display that speaks directly to them. The wonderful thing about designing this display is that you can choose any quote you like and, using a tool like Canva, any design you like. In Canva, you can choose a range of coloured backgrounds, patterned backgrounds, text fonts and text colours. It's a lot of fun, actually. As you create each of your four designs, download them as 'PDF: To Print', save them as a JPEG or PNG then upload them into our canvas app to build your wall display.